Learn about the main challenges for securing connected medical devices, including how to design and deploy scalable credential management systems, end-to-end data security, at rest, in motion, using encryption, establishing enforceable security policies for regulatory compliance and creating root of trust with certified HSMs to deliver patient safety. The Internet of Things (IoT) holds enormous potential across a wide range of applications. From industrial sensors that manage and optimize manufacturing processes, to medical devices that monitor and deliver specialized treatment. However, to realize this potential, security and safety must become the primary focus for deployment. 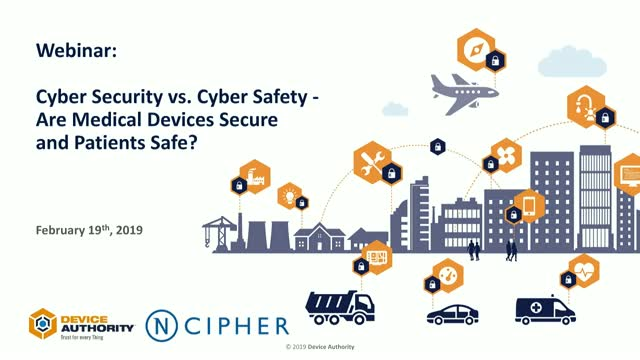 In this webinar, Rao Cherukuri - CTO of Device Authority, a leading provider of IoT identity and access management solutions and Juan Asenjo - Senior Manager at nCipher Security, pioneers in the development of hardware security modules (HSMs), will discuss breakthrough technology that delivers automated device provisioning, authentication, credential management, and end-to-end data privacy, with a robust root of trust. Sign up now to save your seat on our webinar! 4. IoT IAM can be used to operationalize trust and manage the provisioning of millions of devices with zero human intervention at IoT scale. With over a billion connected devices worldwide, Internet of Things (IoT) security remains top concerns for companies of all sizes. The growth of ransomware and IoT-specific botnets such as Mirai and Reaper have heightened awareness and security concerns of IoT devices. Even though many organizations may not have been victimized by IoT security breaches yet, they must start assessing their IoT security strategy and how to leverage IoT IAM technologies to reduce IoT security risk. Join this webinar to learn how you can leverage Public Key Infrastructure (PKI) with the scalability and automation for strong authentication and data protection through encryption. We will explore how this is relevant for different industries including national and local Government, Education and Healthcare. The Internet of Medical Things, or Healthcare IoT, refers to a connected infrastructure of medical devices and software applications that can communicate with various healthcare IT systems. Frost & Sullivan estimates that there were 4.5 billion IoMT devices in 2015, a number that they expect to increase to between 20 and 30 billion by 2020. As the IoMT device landscape heats up and hospitals delve more into remote care, healthcare systems need to protect each and every IoT device from potential cybersecurity risks. To do this, medical device manufacturers should integrate the power of automation into a rock-solid digital technology foundation, making it easier to stay on top of the security needed to protect both the device and the patient, while also adhering to regulatory compliance. Hear from Device Authority, SyroCon and PTC on a real customer use case which encourages building secure connected IoT medical devices. Learn about potential benefits, best practices and key challenges, and how they can be solved with out of the box solutions and integrations between PTC, SyroCon and Device Authority. With the hype and popularity of crypto currencies, there has been tremendous publicity about Blockchain, the distributed ledger technology and its use cases. The hype around blockchain is growing with the vast majority of Enterprises saying they are “actively involved” in the technology. Blockchain relies heavily on Public Key cryptography, but it doesn’t have a defined security model to secure the participating nodes and associated private keys. Enterprise private blockchain operations are substantially different, often utilize a permissioned network in which consensus can be achieved through a process called “selective endorsement,” where authorized peers verify the transactions. The advantage of this for businesses is that only participants with the appropriate access and permissions can maintain the transaction ledger. This calls for traditional Enterprise IAM (Identity and Access Management) methodologies to be extended to participating nodes. Device Authority specializes in device centric IAM with a focus on automated PKI and security management functions for entities and data. Our KeyScaler platform delivers the entity and data trust at scale for any Enterprise Blockchain implementation. In the new mobile, cloud and social enabled world, the corporate perimeter has dissolved. Experts agree that Identity now has become the new perimeter. However, in an environment where IoT devices are growing at a rate that will soon outpace the number of humans, it is important to not only manage the identity lifecycle of users, but to establish a verifiable identity model that can scale across billions of devices. Join this webinar to learn why IT and OT must collaborate to create a comprehensive identity management program that includes digital identities, physical identities and device identities to deliver a holistic view of security. To be successful with any IoT implementation, scalable trusted identities which are easy to manage throughout the lifecycle are required. 4. Learn how enterprise device management can be used to operationalize trust and manage the provisioning of millions of devices with zero human intervention at IoT scale. 5. Learn how IoT Security is redefining Cyber security to enable Digital Enterprise. Understand the comprehensive IAM (Physical, Digital, Things) model. Title: Cyber Security vs. Cyber Safety – Are Medical Devices Secure and Patients Safe?